Citizens of America should have a BIG problem with the growing abuse of power known as mandatory arbitration. Jason Hartman and the team at Solomon Success have been watching this perversion of justice on the horizon for a while now. 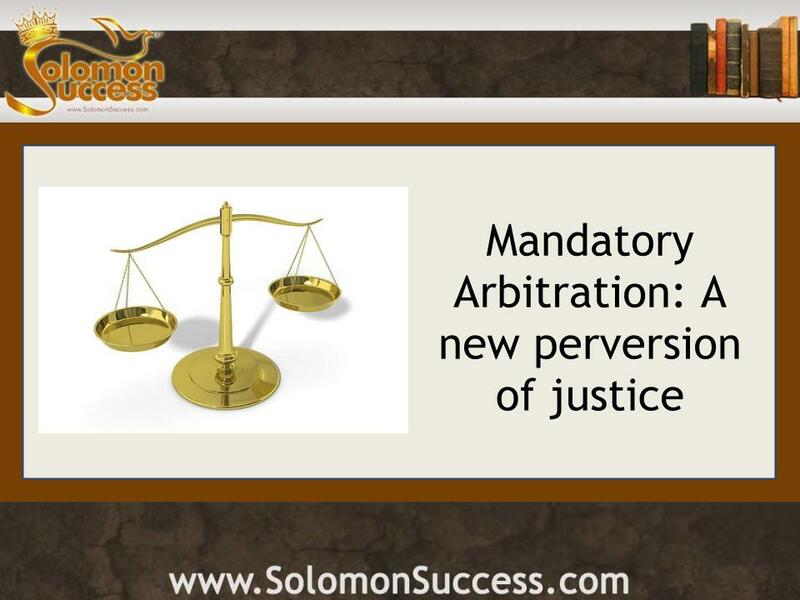 What is mandatory arbitration? In short, it’s a neat little way for large corporations to circumvent the process of justice guaranteed by the US Constitution. At the center of its black heart, mandatory or forced arbitration is a way that corporations have discovered to circumvent due legal process through their willing accomplices in the United States Senate and House of Representatives. But wait, isn’t securing one’s “day in court” guaranteed in the Constitution? We always thought so. Both the wording and intent in the 5th and 14th amendments seem pretty clear about the framers’ intent to preserve the civil rights to life, liberty, or property of every citizen. 1. There’s no judge, jury, or right to appeal. 2. The arbitrator chosen to hear your case doesn’t have to follow the law. 3. There is no review process to make sure justice was served. Furthermore, the forced arbitration clause in the contract you signed allows the company you’re having a problem with to choose the arbitration firm and arbitrator; it should be no surprise to learn that it’s often one with which they have an incestuously cozy (and profitable) relationship. The bottom line is this: if you’ve been harmed by fraud, predatory lending, discrimination, negligence, defective products, or other scams, there’s a good chance you won’t end up in a legal courtroom but rather a judicial perversion of the worst kind. Welcome to America!